Wesley Chapel, Fla. (December 26, 2017) – Metro Development Group, a leading Tampa developer of master planned communities, announced today that they have completed the fill of the first-ever Crystal Lagoons’ amenity in the U.S.
After much anticipation and excitement, the long-awaited Epperson lagoon in Pasco County, FL is full as of today, forever changing the landscape of master planned communities. Metro Development Group will commemorate the first-ever Crystal Lagoons’ amenity in the U.S. with a ribbon-cutting ceremony at Epperson on Friday, January 5, 2018. Residents will soon enjoy the 7.5-acre crystal-clear lagoon and a variety of aquatic recreational activities, such as swimming, kayaking, stand-up paddle boarding and even using small (non-motorized) sailboats. The lagoon at Epperson will have exciting features, including a waterslide, private cabanas, in-water obstacle platform, swim-up bar, tidal pool, restaurant, family beach, yoga lawn, an entertainment plaza, an area for special events and much more. Metro Development Group partnered with Crystal Lagoons back in September 2015 to be the first developer to bring these crystal-clear lagoons to the U.S. Epperson is the first of five lagoon projects that Metro is building in Florida. Metro is the first U.S. developer to get approved plans, first to break-ground, and now Metro is the first developer to fill a Crystal Lagoons’ amenity in the U.S.
Now that the first of Metro’s five planned lagoons is full, the others won’t be too far behind. Metro Development Group will soon break ground on a second Lagoon at the Metro Places community Southshore Bay, located in Southern Hillsborough County in early 2018. Upon completion, each lagoon uses 50 times less water compared to a park of the same size and 30 times less water than an 18-hole golf course. The lagoon is maintained by Crystal Lagoons’ ultra-sonic technology that uses sensors to monitor the quality of the crystal-clear water. This sustainable technology also uses 100 times less chemicals than a traditional swimming pool and uses up to 50 times less energy than conventional pool filtration systems. 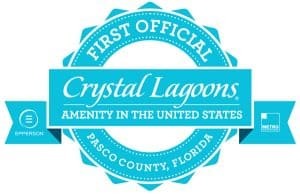 This first full Crystal Lagoons’ amenity in the nation is also part of the first ever Connected City, which has been designated the first “Smart Gigabit Community” in the country to be built from the ground up. Metro Places exclusive technology, ULTRAFi, provides the fastest internet and WiFi speeds in the nation throughout the homes, the community and the lagoon. A Tampa-based company founded in 2003, Metro Development Group is committed to bringing some of the most innovative technologies and amenities to homebuilders and homebuyers. With the introduction of the Connected City, Metro Places, ULTRAFi and Metro Lagoons by Crystal Lagoons, Metro continues to be the gold standard in the development of master planned communities. For more information, visit www.MetroDevelopmentGroup.com and www.MetroPlaces.com. Crystal Lagoons is a multi-national water-innovation company with US headquarters in Miami and additional offices in Dallas and Los Angeles, which has developed an innovative concept and technology, patented in 190 countries, enabling the low-cost construction and maintenance of unlimited size bodies of water in crystal clear conditions. Crystal Lagoons’ impressive turquoise waters are revolutionizing the real estate world as well as water and energy production. Applications range from bringing idyllic beach life to locations otherwise thought unimaginable to providing industrial solutions for closed-circuit cooling systems for thermal power plants and data-centers, among others. More information is available at www.crystal-lagoons.com.